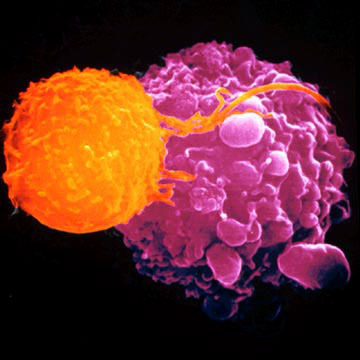 Chronic lymphocytic leukemia (CLL) is a slowly progressive blood and bone marrow disease found mainly in adults. It occurs when too many blood stem cells become lymphocytes, eventually crowding out other blood cells and leading to an unhealthy balance of cell types. In addition to being ineffective at fighting infection, these CLL cells have on their surface a glycoprotein receptor for hyaluronic acid, CD44. This receptor may be responsible for mediating survival of these leukemia cells. Recently researchers at the University of California at San Diego have determined that RG7356, a humanized monoclonal antibody, directly targets CD44 on leukemia B Cells but has no effect on normal cells. The principal investigator of the lab is Thomas Kipps, M.D., Ph.D., Evelyn and Edwin Tasch Chair in Cancer Research. Together with his colleagues he found that in addition to being directly cytoxic to leukemia B cells, RG7356 induced CLL cells that expressed the protein ZAP-70 to undergo apoptosis, also called programmed cell death, which is a process that does not require assistance from other cells. As many as half of CLL patients have a form of the disease that includes cells expressing ZAP-70 and this generally represents a more aggressive progression. When used in vivo RG7356 leads to both cell death and reduced expression of ZAP-70. Previous research on CLL cells by Kipps and other labs has shown that when removed from the host these cells undergo apoptosis or drug-induced cell death. B cell chronic lymphocytic leukemia is therefore often described as a process of defective apoptosis rather than excessive proliferation. This failure to undergo programmed cell death indicates that these leukemia cells must be receiving survival signals from surrounding cells, specifically non-tumor cells. When removed from this supportive environment the leukemia cells cannot survive. CD44 appears to be one of the receptors that transmits survival signals. However, when leukemia cells are exposed to the monoclonal antibody RG7356, the receptor internalizes and complexes with ZAP-70, leading to reduced expression of ZAP-70 and apoptosis. There is also some evidence that down-modulation of CD44 in CLL cells renders these cells more resistant to survival factors contributed by the surrounding environment. The effects of RG7356 on both ZAP-70-positive and –negative CLL cells bodes well for future clinical trial studies. The clearance of engrafted ZAP-70-positive CLL cells by RG7356 implies that this antibody might be an effective treatment for patients with chemotherapy-resistant disease. Because CD44 has also been implicated as a marker for cancer-initiating cells, RG7356 is currently being evaluated for use in clinical trials involving patients with solid tumors. Since CD44 is found on normal cells as well, patients undergoing RG7356 treatment will need to be closely monitored for adverse effects from the monoclonal antibody. Information gleaned from these trials will be useful when designing further studies to investigate the mechanism of CLL cell death by RG7356. Wilbur Copeland has worked as a medical lab technician for the past 7 years. For more information on antibodies, visit https://www.abgent.com/.